Even coming up with a title for a blog post on eating more vegetables was a challenge! We all know that eating primarily a plant based diet is optimal for good health, yet getting those extra servings of that “green stuff” can be daunting given time constraints and tastes. A new study found that eating just one extra serving of vegetables daily cut cancer rates significantly. Now that gets my attention! Research makes it very clear that in order to be healthy one must eat more fruits and vegetables and exercise more. We hear it and know it to be true, but it seems so boring! Advertisers know this and are like predators that prey on our weaknesses. We are bombarded relentlessly by advertising that seduces us with images of grossly unhealthy junk food that is designed to get us addicted to it like an illicit drug. The simple truth is, if you buy it you’re gonna eat it! We fool ourselves saying it’s for my husband or the grandchildren are coming, or I need dessert for company. The reality is if it’s not good for you, why serve it to someone else! The secret is to go back to sane, simple eating. It’s all about the taste and quality and freshness of ingredients. There is a way to enjoy the most delicious food without sacrificing taste or its health-giving goodness. We all have had the experience of biting into a freshly picked, juicy strawberry or a crunchy carrot or crispy apple that awakened the senses and filled us with an awareness of wholesome goodness. 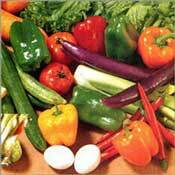 My video blog will show you how to get many more veggies into your diet effortlessly and so deliciously! Membership is FREE! Join Us, Won’t You?